Provides accurate first stage regulation in two-stage bulk tank systems. Reduce tank pressure to an intermediate pressure of 5 to 10 PSIG. Also used to supply high pressure burners for applications like industrial furnaces or boilers. Also incorporated in multiple cylinder installations. 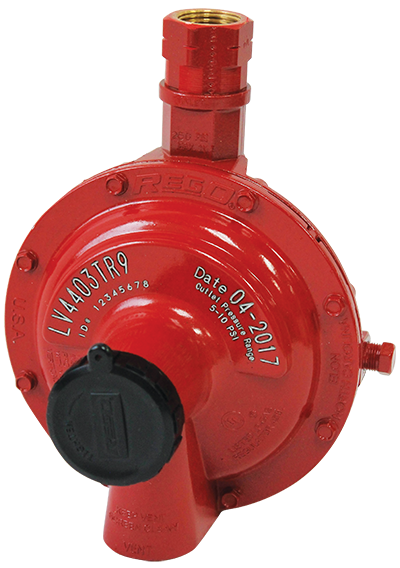 Incorporate integral relief valves for added system protection. Large vent helps prevent blockage and has ¾” F.NPT thread for vent piping. Bonnet vent positioned over outlet to avoid icing and contamination by foreign material. Unique bonnet vent profile designed to minimize vent freeze over when properly installed. Replaceable valve orifice and valve seat disc. Straight-line valve closure reduces wear on seat disc. Large molded diaphragm is extra sensitive to pressure changes. Built in pressure tap has plugged 1⁄8” F.NPT outlet. Plug can be removed with a 3⁄16” hex allen wrench. Extra long lever arm provides uniform delivery pressure.